Yesterday, Fifa Executive Committee member Theo Zwanziger, said he believes the 2022 World Cup will not be played in Qatar. The computer generated image from Qatar’s FIFA pitch shows Lusail City that will host the final. However, Lusail City doesn’t even exist yet. The picture appears like a metaphor for how the Qatari committee sold the games to the FIFA: a fairytale-like world that actually doesn’t exist. 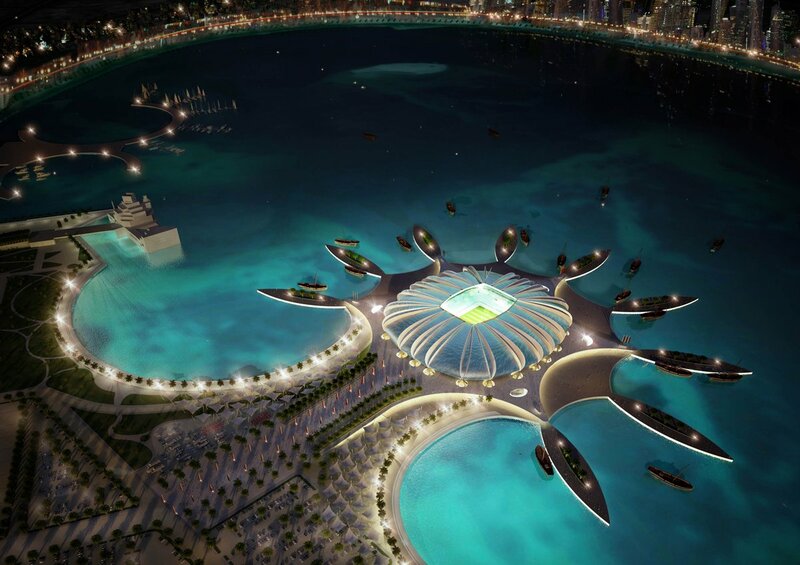 The Qatar games could be the most absurd scenario in the history of the global tournament. Consider for a second the initial idea of these world spanning sport events: to battle against each other in a peaceful manner. However, more than 1,500 workers died so far during the ongoing construction process – and this number will most likely increase. The Business Insider impressively presents 17 reasons why the Qatari World Cup is already a disaster – from modern day slavery, homophobic laws, enormous numbers of bribe to serious medical concerns due to totally inappropriate climate conditions. Theo Zwanziger’s belated de facto rejection of the games primarily relates to climate conditions without any reference to the dubious political nature of Qatar as a host country.